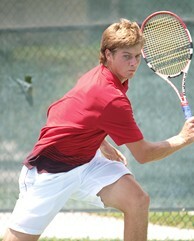 BOCA RATON, Fla. – There are times when it’s easy to tell that Ryan Harrison is still just 18 years old. Like when he hopped into an ice bath at the USTA Training Center Headquarters Thursday afternoon and shrieked as loud as an elderly woman at a horror movie. Then there are times when Harrison appears anything but 18. Such was the case moments before his embarrassing encounter with the ice bath, when Harrison varied his serve and strategy brilliantly to defeat Greg Ouellete and advance to the final of the inaugural US Open Wild Card Playoffs. With a high-bouncing kick serve and a reliable volley, Harrison (Bradenton, Fla.) has yet to be broken through two matches, despite a heat index on court of well over 100 degrees. "I’ve been mixing my serve up well," said Harrison, who won his first match on the ATP World Tour at 15. "One of the things I’m confident in is that I can hit all the spots." The young American broke Ouellette (Ormond Beach, Fla.) twice in the opening set. When Ouellette, 24, had looks at his opponent’s service games, his opportunities didn’t last long. Harrison erased a break point at 3-1 in the first set with a sharp forehand volley and then escaped 30-30 at 5-1 by serving and volleying successfully on consecutive points. Ouellette raised his game at the start of the second set, holding in the first game behind a down-the-line backhand winner. He earned a rare second break-point chance in the next game but saw it disappear as fast as the ace Harrison hit to save it. In the fourth game of the set, Harrison kicked a serve in the Ad-court with so much spin that it catapulted off of Court 18 and into the adjacent court for an ace, interrupting play in the women’s semifinal between Beatrice Capra and Krista Hardebeck. "I have the ability to hit every serve, whether it be a slice serve, kick serve or a flat serve," said Harrison. "But I feel like when you have that ability, you have to be smart about how you use it. Having many different tools can be a weapon, but it can also be a detriment." Up a break two games later, Harrison pulled off a play not seen very often in the modern men’s game. Following a second serve to the net, Harrison knifed a backhand volley that bounced backwards before Ouellette could catch up to it. Serving for the match at 6-1, 5-4, Harrison let two match points slip away from 40-15. At deuce, Ouellette unleashed on a backhand return that could have been a winner had Harrison remained on the baseline. But the teen was at the net again, placing a forehand volley deep in the court to draw an error from Ouellette. Harrison converted his third match point with an ace out wide past Ouellette’s lefty forehand. "Today, I knew I wanted to get it high and away on his backhand, and I was going to try to rush it to his forehand," said Harrison. "The whole time I was trying to set those patterns up with my serve." In Friday’s final, the 222nd-ranked Harrison will play world No. 196 Tim Smyczek (Milwaukee) in his fourth best-of-five set match in the last nine months. After winning the 2010 Australian Open Wild Card Playoffs in straight sets against Jesse Levine, Harrison lost to Janko Tipsarevic of Serbia in his Grand Slam debut. He fell in the final of this year’s French Open Wild Card Playoffs to Ryan Sweeting in four sets. "My favorite thing about playing three-out-of-five sets is that you get to eat until you’re full and then keep eating," said Harrison in another youthful moment. "You’re gonna burn it all off, so you’ve gotta make sure that you have the energy to last. I’ll eat a huge meal tonight." Smyczek, who has never played an official five-set match, used a stroke of luck to capture a 7-6 (5), 6-3 win over Alex Domijan in Thursday’s first semifinal. Three strokes, actually. At 2-2 in the first-set tiebreak, Smyczek hit a backhand that dribbled off the net cord and onto Domijan’s side of the court for a winner. On the crucial 5-5 point of the tiebreak, Smyczek hit the same shot with the same result, stealing a mini-break to serve for the first set. When Smyczek hit his third backhand off the tape of the tiebreak at 6-5, Domijan (Wesley Chapel, Fla.) scurried frantically to reach the ball. Though he did get his racquet there in time, Domijan sliced his own backhand long, handing the first set and the momentum to the 22-year-old from Milwaukee. "That was really lucky," admitted Smyczek. "I felt like I needed a little luck to get by in the first [set] because he was firing on all cylinders." Playing a towering teenager who stands closer to 7’ than 6’, the 5’ 9" Smyczek was broken to open the match before breaking back in the fourth game. He closed Domijan out by breaking the tall teen’s serve at 3-3 and 5-3 in the second set, when he says good fortune was on his side again. "I had to work really hard for the break in the first set, and then in the second, I think I got a little bit lucky," said Smyczek. "He was up 30-love, and I hit a good, on-the-run shot that he let go, which ended up being in. And then he hit three double faults." If Harrison used good serves and Smyczek used good fortune to reach Friday’s final, Madison Brengle used survival skills to defeat Nicole Gibbs, 7-6 (6), 6-0. Brengle blew a set point on Gibbs’ serve at 5-3 and another on her own serve at 6-5, before saving three set points in the tiebreak of a 78-minute first set. "It was a little on the long side," quipped Brengle. "I just fought really hard in the first set." After breaking Gibbs to open the match, Brengle (Dover, Del.) appeared poised for a second break in the ninth game of the first set. But Gibbs (Santa Monica, Calif.) saved a set point by employing a new tactic, rushing the net for a backhand drop volley winner. Gibbs was back in the front court again in Brengle’s subsequent service game, knocking off a backhand volley and then blasting back-to-back forehand return winners to reach 5-5. "When I was up 5-3, I should have probably put it away," said Brengle. "But I got a little tight, and she started really going for her shots. She closed the net really well. My ball was getting shorter, and hers was getting deeper." But Gibbs, who was playing her ninth singles match in the last 11 days, blew a 40-love lead to give the break back to Brengle. Brengle followed suit, missing a forehand long on her second set point, opening the door for Gibbs to blast an overhead winner and an unreachable inside-out forehand to force a tiebreak. Gibbs, 17, held three set points with a 6-3 lead. She nearly converted the first with a cross-court forehand that was called out by chair umpire Jim Natale. On the second, Brengle hit a second serve off the line, jamming Gibbs for a service winner. After Gibbs missed a pair of forehands, Brengle hit a squash shot on the run to draw an error and win the first set. In the second set, Gibbs let break points slip away in the first and third games, sealing her fate and sending Brengle into the fifth wild-card playoff final of her career. The world No. 170 won previous playoffs leading up to the 2007 and 2008 Australian and French Opens. "I haven’t lost a final," said Brengle. "But I don’t want to jinx myself. That was a long time ago." To win wild-card playoff No. 5, Brengle must overcome the red-hot Capra (Ellicott City, Md.). Bullying balls from the baseline, Capra, 17, beat the 15-year-old Hardebeck, 6-3, 7-5. Capra, who trains on-site at the Evert Tennis Academy, enjoyed the support of Hall-of-Famer Chris Evert, who watched from outside Court 19. "She e-mails me all the time, asking how I’m doing," said Capra, who has qualified for four USTA Pro Circuit events in 2010. "It’s really exciting that she’s taking the time to come out and watch me." Capra crushed cross-court winners to save two break points in the six-deuce, second game of the second set, holding for 1-1 before breaking Hardebeck in the very next game. Though Hardebeck (Santa Ana, Calif.) would break back, Capra thought her first service game of the second set was crucial to her chances of reaching the final. "I knew she wasn’t going to give up," said Capra, who clinched the win on her third match point. "So I really needed to fight to get that game because I think if she would have gotten it, she would have taken off in the second set." After the men kick off the finals at 10 a.m. Friday, Capra and Brengle will meet for the third time in their relatively brief careers but for the first time since 2008. Brengle won a clay-court meeting on the USTA Pro Circuit, while the younger American was victorious on hard court. Capra is hoping to erase memories of the 2010 French Open Wild Card Playoff final, in which she took an early lead against Christina McHale before falling in three sets. "I’ve learned from my mistakes last time, when I got nervous in the end," said Capra. "I’m really excited, and I think I have a good shot tomorrow."